The NRCC Hackers: Eric Pannell, Ankan Basu and Chris Price. 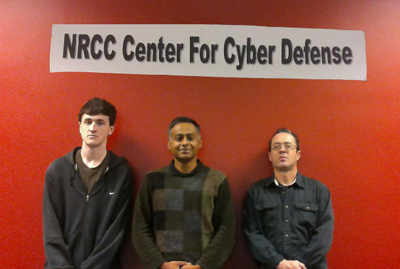 NRCC cyber team moves to round 2 of the RUSecure CTF Contest, Radford University Cyber Security Contest. The team, NRCC Hackers, placed 7th out of 70 teams. Winners of the 3rd and final round receive Radford University scholarships. On Saturday April 29 from 9-1:00 the NRCC Computer Club will host a cyber day at the Mall site room 127. Bring your desktop, laptop, tablet, or phone (Windows or Android only) for a free tune up and virus check. Got a computer problem? Our students can diagnose it and recommend a fix. This event is free and open to all students, faculty, staff, and member of the public. 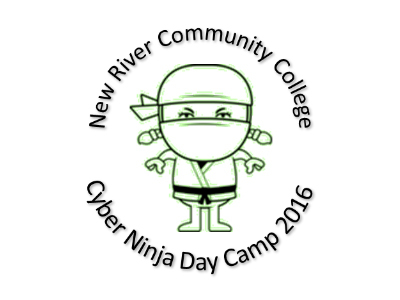 Cyber Ninja Day Camp for area middle/high school girls. Forty-five area middle and high school girls had an opportunity to become Cyber Ninjas at a unique day camp being held at the NRCC New River Valley Mall site in Christiansburg last July 2016. The camp, which was free of charge, ran from July 11 through 15 from 9 a.m. to 3 p.m. The week culminated with a one-hour session open to family and friends to view the projects completed during the camp. Three areas of the cyber world were covered during the week-long day camp: “cyber safety games” where students created their own game encouraging good security practices; “securing the internet of things” where students 3D printed a drone and flew it on cyber missions; and “cyber security detective agency” where security software was used to solve mysteries. Campers received lunch every day and a t-shirt, USB, and a Raspberry Pi at the end of the week. Funding for the camp was made possible through a National Security Agency grant.